Hide your Oranges and Apples! There's a dark storm brewing black cloves and death, its up to you to figure out how to protect helpless oranges and apples. If you can't run, HIDE! Make sure the orange smileys are protected from the deadly rain in the second part of this fun series. You are a master detective, ready to solve any crime.. But can you solve this one? 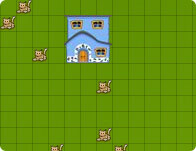 Use your mouse to click the missing items and complete the levels. The pages of your notebook hold within them the secrets of time, space and the universe. Traverse black holes, flip switches, avoid ninja stars and hack gravity in order to send your sphere home! Get quantum! This puzzling platform suits you up with a special teleporter and makes you figure out how to use it to traverse ever puzzling levels of difficulty and fun! Tilt the board to collect the pickups and get your marble to the exit. 20 levels, lots of bad guys, Gold, silver, bronze medals for times on each level. Your mission is to destroy the totems without letting the golden Idol (aka Tot) fall into the ground. Use balance to keep Tot up. Drag the items in the bottom of screen to fill the baggage compartment of the train in the time limit.